For week #12 (ending 3-23-19) the CDC reported that Influenza (Flu) activity, which includes diagnosed flu as well as ILI (Influenza-Like-Illness), decreased but was still elevated during Week #12. The percentage of respiratory specimens testing positive for flu decreased to 22.1% from 26% last week with all 10 Regions reported flu levels above their baseline. Also, the number of hospitalizations from flu continued to increase. The CDC expects flu and ILI activity to stay at elevated levels into mid-April, however none of the numbers approach last season’s (2017/18) flu severity. In the samples tested, Influenza A viruses were the largest percentage of viruses. For the fifth week in a row this flu season, Influenza A(H3) was more prevalent nationally and dominant in all the Regions. Overall, Influenzas A (H1N1), A (H3N2) and Influenza B viruses were co-circulating, with Influenza B cases increasing slightly, a sign typically seen in the spring. The majority of the flu viruses were genetically similar to the 2018/19 Flu Vaccine, but an increasing amount of the Influenza A(H3N2) viruses are antigenically different from the H3N2 reference virus used in the 2018/19 North American Hemisphere Flu Vaccine. Changes to the 2019/20 North American Hemisphere Vaccine have been recommended and adopted. The CDC has published its 2018/19 Flu Season Preliminary Burden Estimates, and from October 1, 2018 through March 23, 2019, and there have been an estimated with 31.2 – 35.9 million flu illnesses, 14.4 – 16.8 million medical visits for flu, 419,000 – 508,000 flu-related hospitalizations, and 28,000 – 46,800 flu deaths. FirstWatch RIN (Regional Influenza Network): RIN Alerts for Week #12 showed an increase in numbers. Influenza-like illness (ILI) visits to clinics & other non-hospital facilities decreased to 3.8% (l. w. 4.4%), but remained above the national baseline of 2.2%. All 10 regions reported ILI at or above their region-specific baselines, with a range of 2.8% to 5.6%. Twenty (20) states reported high ILI activity. Flu cases, documented by positive flu tests of respiratory specimens, were reported as Widespread in Puerto Rico and 34 states. Clinical lab testing for influenza was positive for 22.1% of specimens, compared to 26% last week, with a range of 11.5% (Region 9) to 36.7% (Region 10). All regions were in the double digits, with five (5) at > 20% and two (2) at > 30%. Influenza A remained the dominant flu for 94.6% of the flu tests reported (last week 96.4%), and the H3N2 subtype remained the dominant Influenza A virus at 68.1% (65.4% last week), as A(H1N1)pdm09 viruses decreased to 31.9% (34.6% l.w.). The rest of the tests showed 5.4% (3.6% l.w.) tested as Influenza B viruses, with Yamagata at 23.1% and Victoria at 76.9%. Typically, Influenza B viruses occur more towards Spring and cause less severe illness. This pattern is mirrored in much of the world. More than 99% of the flu viruses tested were found to be sensitive to the antivirals oseltamivir, zanamivir (100%), and peramivir (Tamiflu, Relenza, and Rapivab, respectively). The Hospitalization rate from Flu increased to 52.5 per 100,000 (last week 47.1/100,000). Older adults (age > 65 years) had the highest hospitalization rate at 167 per 100,000 (l.w. 146/ ); adults (age 50-64 years) were at 67.4 per 100,000 (l.w. 61/ ); and children (ages 0-4) had 63.6 per 100,000 (last week 59/ ). As of 3/28/19, the death rate for pneumonia & influenza in adults was at 7.4%, above the epidemic threshold of 7.2% for week #11. Note: the epidemic threshold number may change from week to week. Death reports often aren’t reported for data purposes the same week and are typically reported by the CDC a week behind. There was one (1) pediatric death attributed to flu reported this week and occurred in Week 12, for a total of 77 for this Flu Season. According to the Public Health Agency of Canada (PHAC), for Week #12, ending 3/23/19, Influenza was reported in almost all the Regions, though circulation was at greater levels in some Eastern Regions. The PHAC also reported that Influenza A(H3N2) cases have been increasing since the middle of Jan and represented 72% of the Influenza A subtyping, this week, compared to 64% for last week, though A(H1N1)pdm09 was still the dominant type for this Flu Season as a whole. Influenza A(H1N1) peaked at the end of December, but a smaller wave of flu cases with A(H3N2) dominating for the past month, has been seen in most Regions of the country. Meanwhile, very little Influenza B has been identified this season when compared to other seasons. According to the European Center for Disease Prevention & Control (ECDC), for Week #12 (Mar 18 – 24, 2019), for the 45 countries reporting on geographic spread of influenza activity, only 11 had widespread activity, namely in the Northern, Southern, and Western areas of Europe. The samples taken from those with ILI or ARI (acute respiratory illness) by sentinel primary healthcare sites, decreased to 38% positive for flu viruses, compared with 39% last week. Those reported with severe acute respiratory infection (SARI) that were tested for flu viruses, resulted in a result of 21% and almost all were Influenza A. Overall, Influenza A viruses dominated, with more A(H3N2 than A(H1N1)pdm09; with few Influenza B viruses found. Data from the reporting Member States and areas that reported to the EuroMOMO project indicated that excess mortality had returned to normal levels. First Responders should be vaccinated for Flu each season to prevent getting flu themselves, taking it home to family members, or transmitting it to patients in their care. Family members and patients may be at increased risk of complications from flu. Perform proper hand hygiene including frequent handwashing and the use of hand sanitizers in general, and particularly when providing patient care or after touching surfaces. Masks (N95 or N100) should be used in the presence of patients with cough and/or fever; preferably before being within 6 feet of the patient. This becomes even more important if droplet producing procedures are being performed (i.e. suctioning, nebulizer treatments, BVM, intubation). Care should be taken to avoid touching your own face and mucous membranes (eyes, mouth, nose) since the flu virus is frequently found on surfaces such as door knobs, writing & recording tools (pens and tablets), cot and equipment handles, phones, light switches, as well as clothing, bed clothes, etc. Report signs/symptoms of flu to your physician or other appropriate provider for early assessment and care. Alert your employer per policy. Stay away from others if you are sick. Be aware of your exposure risk and history to prevent exposing others. Take extra precautions or avoid those with immunocompromise, when possible, if you have a known or likely exposure. Flu is much more worrisome for the very young and the elderly, as well as those who fit into one of the high risk categories see this link for the list: https://www.cdc.gov/flu/about/disease/high_risk.htm . Signs of ILI/Flu in this group requires careful assessment to rule out complications and these groups are much more likely to need medical oversight to assure adequate care. Young children and those over 65 are typically at greater risk for complications, hospitalization, and even death. Consideration should be given to perhaps monitoring these groups more closely, with inclination for more comprehensive assessment and transport for further evaluation, when presented with possible flu and any signs of complications. Complications of flu, sometimes requiring hospitalization and even leading to death, tend to occur after the person has begun to get better from the flu and then appears to relapse. EMS personnel may want to look more closely at those patients when the call is not about the initial signs and symptoms of flu, but about increasing or different signs that have appeared, often from five days to two weeks after the initial flu symptoms began. 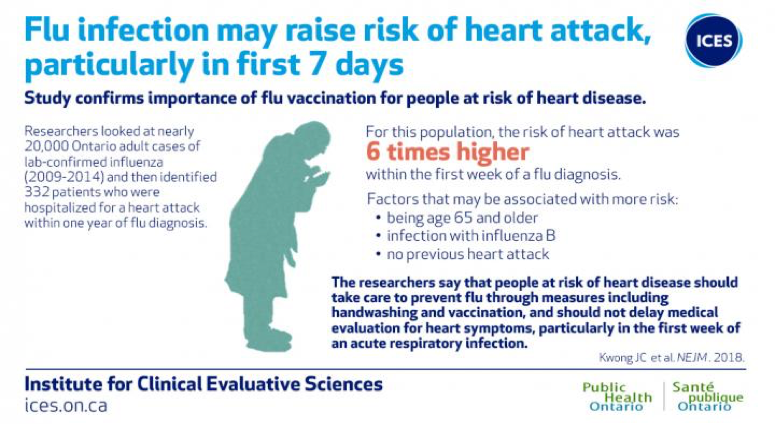 For more information on Influenza and the Heart Attack Study, please see the link below.